MISSISSAUGA, ONTARIO--(Marketwired - June 13, 2017) - Editors' Note: A photo for this release is available on the Canadian Press picture wire via Marketwired. 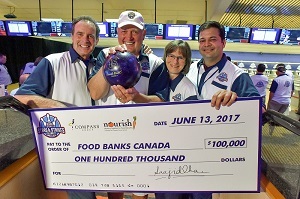 Compass Group Canada presented Food Banks Canada with a cheque for $100,000 today at the Compass Stars and Strikes Celebrity Charity Event. The event is a key fundraising element of Compass' Nourish program. The funds raised today through the generosity and support of Compass suppliers will be used to increase the amount and diversity of fresh, nutritious food to families-in-need through community gardens and food education programs at select food banks across Canada. The level of food insecurity continues to increase across Canada with more than 860,000 Canadians turning to food banks each month. Compass' $100,000 donation will help create sustainable solutions to ensure all Canadians, regardless of income, have access to safe and nutritious food to lead healthy and productive lives. "As a leader in foodservice, we understand the important role that quality food plays in our everyday lives and we strongly believe that everyone should have access to fresh, nourishing food." said Saajid Khan, CEO, Compass Group Canada. "Community gardens do more than just provide fresh local food. They serve as a hub where people access healthy food and develop relationships by gardening together." "Every day the food bank network aims to put nutritious food on the table for Canadians who are struggling with hunger and these efforts would not be possible without the generosity of companies like Compass," says Katharine Schmidt, Executive Director, Food Banks Canada. "Through programs like community gardens, we not only provide essential fresh foods but also the learning supports so families and individuals in need can be on the path to self-sufficiency." Since October 2014, Compass, through its Nourish program has donated $485,000 to Food Banks Canada. From the Maritimes to British Columbia, Compass has supported over 45 community gardens and provided educational opportunities to ensure high levels of participation in fresh food adoption and healthy eating. To view a short video on Nourish's community impact, visit https://www.youtube.com/watch?v=TXjTxhjvvlU. Compass Group Canada became a market leader in contract foodservice and facilities management through a simple recipe: great people, great service and great results. This easy-to-follow recipe serves millions across the nation, from serving delicious, nutritious meals at school cafeterias, corporate cafes, hospitals and remote camps to routine cleaning and maintenance services at your workplace and airports. Chances are good that if you're hungry and away from home, you've tasted Compass Group's award-winning food and experienced our exceptional support services. For more information visit www.compass-canada.com. Food Banks Canada supports a unique network of over 3,000 food-related organizations in every province and territory that assists more than 860,000 Canadians each month. Together our network shares over 200 million pounds of essential safe quality food annually, provides social programs that help to foster self-sufficiency, and advocates for policy change that will help create a Canada where no one goes hungry. Visit foodbankscanada.ca for more information.